I've heard so much about Markets @ Jaya One ever since I came to KL to study. It's the perfect set-up for a bargain hunter aka shopaholic like me to satisfy my fashion craves. And last Sunday, I finally got the chance to attend it! The crowd was already kinda dwindling cos we arrived quite late on the second day, at about 4pm. I was told that those who went early on the first day got a free goodie bag featuring Tanks for 5 tank tops. Sneak peak of Batch 2 items that will be up soon on Dress & Style! Covetz items going for as low as RM10 per piece! There were stuff for the kiddos too. I expected most of the clothes to go for really low prices, but this was by far the cheapest I saw! Most of it were like RM5-RM25 per piece which is still quite reasonable.. There were mostly brand new and some preloved items from various blogshops too. Bags, accessories and clothes by I Can't Sew (Therefore I Buy). Super cute name haha. They even brought along a portable changing room! There were A LOT of stalls selling accessories that day so I was trying to snag some statement necklaces for myself. Handmade soap and vintage shades, anybody? Project Swissify carries some pretty rad glasses IMO. Spot that cute smiley ukulele! 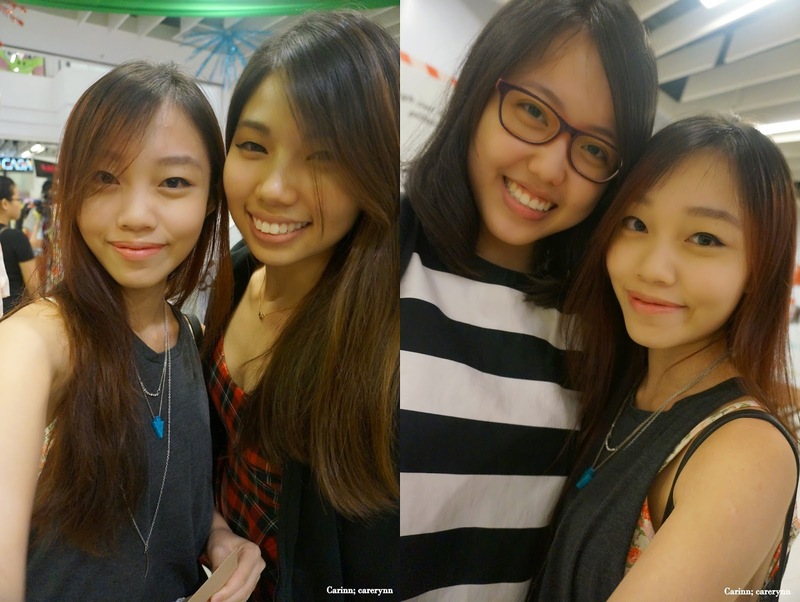 Time for some selfies with my pretty babes and shopping kakis of the day! Thanks Mika, Kwai See and Vincent for bringing me there! Thank you Yik Fei and Yi Xin for the awesome dinner recommendation! If you're hungry or thirsty, drop by the stalls selling food and desserts. Salt 'n KoFFie particularly caught my eye. After shopping, we spotted the Redken van outside, so we all decided to get a free hair styling service for the fun of it. Met a blogger friend there too who coincidentally sat next to me while I was having my hair done. Tadaa the final result! Nice not? You might have seen me post this on my Instagram if you follow me. I was actually inspired by one of the staff outside who did a side braid and curls XD Now my hair doesn't look so flat. How I wish I could have nice hair like this everyday! But.. I'm too lazy/ noob to style my own hair..
Those who got their hair styled and photos taken will also stand a chance to win the #MyRedkenStyling grand prize and take home some products to try! And how could I leave a bazaar without buying anything? Here's my mini haul of the day. Surprisingly I didn't buy much, because most of the items that I fancied are either too pricey or not in my size.. But I'm still really happy with my haul! I got all these for about RM68 only?! Coincidentally, most of the items I bought came in brown paper bag, which is something I love. My favourite item of the day - this beautiful statement necklace from Entree for RM15. Most of the necklaces I saw were RM30+ so this was the best bargain ever! Saw Noteworthie selling these beautiful notebooks for a discounted price of RM5 and I couldn't resist getting my hands on one. It has a calendar inside so hopefully I'll utilise it to jot down all the things I need to do. Plus, I like that it's small enough to fit in my bag. Lastly, I got myself some temporary tattoos. Habitatt was selling these temporary tattoo stickers for RM8 for any 3 designs so I got them and used one on the spot. They gave a complimentary mangosteen sticker too for following them on Instagram, in conjunction with Merdeka month. Were you at Markets last weekend too? Share with me your experience and hauls, I would love to see them! I can't wait for the next bazaar, sometimes I wish JB could have more events like this too. It'll be so fun! Let's go for the next one! Hehe. Aww. Did you buy anything? Too bad didn't see you!